Greene Stuff: Just For Fun....Sorry Cole!! I had to add this photo from our vacation. 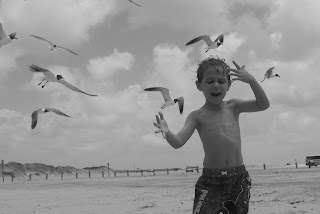 It is too funny...the birds really weren't attacking Cole but it sure looks like it so I wanted to share!! I'm not really sure what he was doing but knowing him.....complaining!! Too cute! I love his expression!